With the miniaturization of hard drive technology, it is now easy to carry an extra few hundred gigabytes in your laptop bag. I currently carry a Western Digital Passport drive for just this purpose. The problem is that the Passport drive is slow. It is fine for simple storage but falls down when I put any sort of demand on it, like accessing external photos for Aperture. This is what led me to the G-Drive mini. G-technology drives, for lack of a better word, just look cool. If Apple designed external hard drives, they would look like this. They have solid aluminum cases that acts as their own heat sink. There is no fan because the case keep takes care of that for you. This thing looks like a Mac Pro and matches up with your new aluminum MacBook or MacBook Pro perfectly. The dimensions are 4.9" by 3.1" and it is less than an inch thick. There are smaller portable hard drives but the G Drive fits in my laptop bag nicely. As good-looking as the G Drive is, its best view is from behind. In addition to the obligatory USB port, it sports FireWire 400 and 800. The combination of the FireWire 800 interface plus the 7200 RPM drive make the G Drive mini run circles around my other portable hard drives. Moving large files off the G Drive mini is nearly twice as fast as off my Western Digital Passport drive. With these speeds, you can use an external G Drive mini to locate your Aperture library or your Final Cut scratch disk. I also put several of my audio assets on it when doing music. 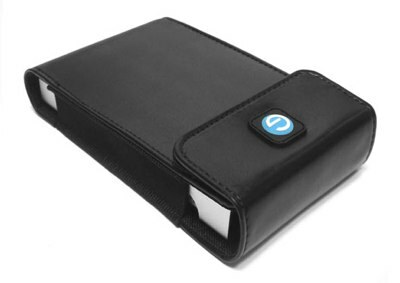 Having such a fast portable drive allows you to recapture precious space on your laptop hard drive. It also lends itself to usage as an external SuperDuper clone or Time Machine drive. If you're looking for a high performance portable drive or routinely move large files off your laptop, you should give the G Drive mini a close look. 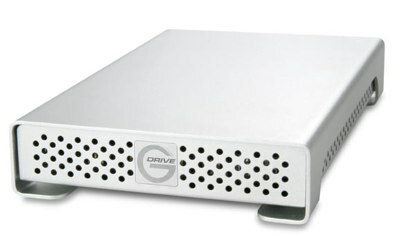 The drive includes a nice case and all the cables you would need to operate it via a USB or FireWire it pulls its power from the FireWire cable so you don't need to carry an extra adapter. The G Drive mini includes a three-year factory warranty. These drives are built to last. While I usually send hardware back after I've finished reviewing it, this is one product I do not want to send back. I will be talking to the folks at G Technology about buying this unit. You can learn more at G-Technology.com where they are sold in a variety of configurations and sizes ranging from $140 to $320. You can listen this review on Surfbits episode 184.